Should I still be using pop-ups on my site? Sure, if it was 2007. I have a client who insists on using pop-ups on their site. They are convinced this will improve customer accessibility and they believe they have SEO value. Is it ever a good idea to use pop-ups on a site? What should I be telling my client? Pop-ups used to be a staple of online marketing but they've quickly fallen out of favor for several reasons. 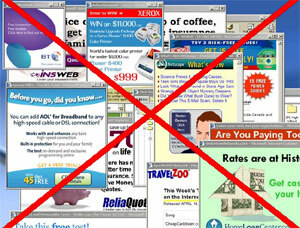 When most people think of pop-ups, they think of annoying browser windows that distract them from the landing page. Even if the pop-up in question doesn't use these techniques, or provides important information for the user, it can still cause problem with accessibility and SEO. Accessibility is all about making your website easy to use, welcoming and trustworthy to your visitors. Pop-ups fly in the face of accessibility for several reasons. First, they interrupt the user experience and may confuse the visitor. If they arrive on a page with a pop-up they may think they've arrived on the wrong page and click away. Visitors come to your website to get specific information based on a link in the search engine results or a PPC ad you control. If they don't see that information right away because of a pop-up, they'll be much more likely to leave your site and never return.